We do not know what William Brown would have made of Brexit. The Just William stories, however, did cover many key political moments in the early to mid-twentieth century. Contemporary commentators find that the stories still have relevance today. “Richmal Crompton’s short story, ‘The Outlaws’ Report’, first published in 1944, revolves around our hero, William Brown, and his gang—Ginger, Henry and Douglas (I don’t recall whether Jumble the dog was present)—penning a response to the report’s publication and smuggling it into the briefcase of a War Office official…. 1. As much holidays as term. 3. Sixpence a week pocket munny and not to be took off. 4. No Latin no French no Arithmetick. 5. As much ice cream and bananas and cream buns as we like free. 6. No punishments and stay up as late as we like. It was good to see journalist David Aaronovitch singing Richmal Crompton’s praises in The Times on 13th February. Aaronovitch argues that Richmal Crompton “created one of the great characters of English literature. And that the way she did it means she stands comparison with Wodehouse and Waugh…. William is almost always on the side of the tramp, the underdog and the rebel in the face of wealth and authority. And though her hero professes to disdain girls, Crompton’s females are invariably reluctant to accept the demure straightjacket society seeks to impose on them” (The Times 13th February 2019). This is, as he suggests, true of Violet Elizabeth, who is a natural rebel and fighter: “I can” is one of her mantras. It is also true of many of the women characters in her novels. Others, however, like William’s sister Ethel, are representative of convention and restraint, but then like her father and brother she just thinks that William is mad. They utterly fail to understand him, whilst we as Crompton’s readers do. I went to a recording of two Just William stories being performed by Martin Jarvis last week. He is quite right, Richmal Crompton was the J.K. Rowling of her day. I plan to write about this over the coming months. The recording was held in the Orange Tree theatre in Richmond upon Thames. I was struck by how many men were there. I have met several of her male fans recently who still think she was a man. 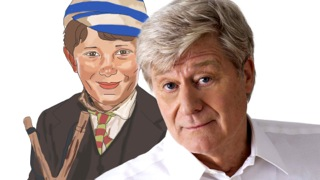 Is the success of Martin Jarvis’s reading just nostalgia for days gone by and their early childhood reading? I don’t think so. William speaks to both boy and man and Martin Jarvis’s performance brings this aspect of her writing to life. Jarvis gives us a thoughtful, strategic William. I overheard a member of the audience put it perfectly. Richmal Crompton does not talk down to children, he commented, which was why he liked her Just William stories so much as a child. Martin Jarvis captures this quality in Crompton’s writing. He gives us a William who can sound ageless. The care Martin Jarvis takes with each word and phrase, the detailed attention to the tone of even the snappiest retort, makes me realise how nuanced these stories are. He performs a William who “gave himself up again to gloomy reverie” and is worried that his new found friend will be “ignominiously ejected” from a local event. His attention to Crompton’s language and his precision timing to heighten the comedy are absolutely critical to our enjoyment. Martin Jarvis’s performance also reminded me that it is often other adult characters in Crompton’s stories who we laugh at, while we laugh with William. William and the Musician: Wednesday 1st May 2019 11:30AM. William and the School Report: Wednesday 8th May 2019 11:30AM. Today seems a good day to revive my blog about the work of the author, Richmal Crompton. Many of her readers may not realise that her real name was Richmal Lamburn. Crompton was her mother’s maiden name. The life of the woman is somewhat hidden behind her work as an author and her most famous character, William Brown. Richmal Lamburn died 50 years ago today. 2019 is also the hundredth anniversary of the publication of the first Just William story. I am thinking of both Richmal and William Brown today. This month I am excited to join The 1938 Club. You can browse posts about all sorts of books published in this year on the Stuck in a Book blog. Take a look. Journeying Wave (1938) by Richmal Crompton, available as an ebook, is a social satire about lives on the cusp of change, whilst others remain firmly rooted in the past. The imagery in the first sentence sets the tone for the novel: “The light filtered softly through the drawn curtains … and flooded the big square bedroom, which, despite the up-to-date furnishings, still retained a vague suggestion of Victorianism”. This is Viola’s room. She comes from a privileged upper class background and her marriage to Humphrey, her second, caused some consternation in her family. Humphrey runs a draper’s shop. Viola has all sorts of cultural interests that she cannot share with him given his limited education and one “part of her had been starved throughout the long years of their marriage”. As a result, she feels that she had “deliberately renounced her birthright for him”. She thinks they have been happy, but Humphrey is leaving her for a younger woman. Humphrey’s unfaithfulness is a “shock to her self-esteem”, and “her cheeks hotly flushed…. The whole thing was horrible”, but this is as much as we see of her emotions. The novel then goes on to trace what happens to different relatives who are influenced by this upset in their insular and protected lives. Hester is older, supported in all aspects of her life by her twin sister, Harriet. She in turn looked after Humphrey for a short period when he was a child and news of his affair shatters her belief in him and her memory of the idyllic time they spent together. She feels lost and goes on a holiday during which she finds a new memory to enrich her life in a relationship with young friends who need her help: “The little episode existed in her mind perfect and complete in itself … It was her Escape, the one part in her whole life in which Harriet had no share, the part that gave her identity”. The memory of her time with Humphrey is a small fantasy, one that Hester replaces with this new experience as she withdraws once again into a life of inaction. A life in which she is happy, relying as she does on Harriet looking after her hand and foot. Humphrey’s influence is more direct in the lives of other members of his family. Bridget, his young niece, feels over wrought amidst the social expectations of her relatives, especially her mother, but with Humphrey “she lost the feeling of uncertainty and bewilderment that was her usual attitude to life”. She feels that he accepts her for who she is, something that her mother seems unable to do. When Bridget learns about his affair this shatters her confidence in her decision to become engaged to someone that her mother does not like. However, she comes to realise that it was “as if she had been in a boat in a quiet stream and an electric launch had passed whose backwash had driven her boat from its course and nearly upset it”. This self-awareness helps her to get her life back on track and she decides to marry the man she loves, whatever her mother thinks about his class and background. Hilary, Viola’s son and Humphrey’s stepson, is also knocked off course by news of their separation and he is lead astray by a group of friends. However, despite the impending divorce, he realises that he still believes in Humphrey, in “his goodness and kindliness”, and this helps him to restore his sense of purpose as he rejects his friends’ dissolute way of life. In the meantime, Viola is being tempted into an affair with Adrian, although she comes to realise that he depends on her, whilst she has always been able to rely on Humphrey up to now. So, what of Humphrey? We learn that he has always felt that Viola “looked down on him from superior heights of breeding, education, intellect”. He feels her coldness when he tells her about the affair, as she remains locked “in her fortress of fastidiousness”. We also learn that lots of people rely on his kindness and care about him. The novel describes how Humphrey is called on to help both Bridget and Hilary. Bridget’s mother, Doreen, demands that Humphrey does something to avert her daughter’s disastrous marriage plans. He does quite the opposite and offers her fiancé a job. Doreen is aghast at this and the criticism she receives about her treatment of one of her servants. She snaps that, “Kindness was always misunderstood and misrepresented”. This seems to me to lie at the heart of the novel’s moral purpose. Bridget and Hilary are examples of two young people who grow up during the course of the novel and come to realise how much Humphrey has meant to them and the extent to which he has helped them in all sorts of ways, without making a song and dance about it. Snobbery and dated social conventions about marriage and class are subtly challenged in this novel. The lives of those who look down on people with working class backgrounds are studied and found wanting. Young people, like Bridget and Hilary, seem to hold the future in their hands as older generations, like Hester, remain stuck in the past. Viola, in middle age, is in danger of losing sight of how much Humphrey means to her. Will she see the light? As ever, Richmal Crompton’s novel offers food for thought. She is not stuck in the past, although she realises that many people of her generation – she was in her late forties when the novel was published – might be.